[caption id="attachment_10769" align="aligncenter" width="300"] Hashtags & Handbags[/caption] As far as Big Apple Buddy customers are concerned, review of Allbirds wool runners has always been great. 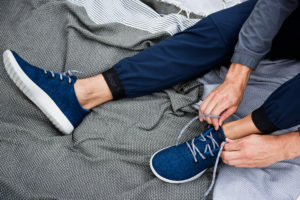 Allbirds has raised the bar for casual-shoe comfort, from the temperature-regulating, moisture-wicking merino wool, to the machine-washability that makes for easy maintenance, to the flexible support of a lightweight foam and rubber sole (who needs socks when your shoes are this soft?). Refinery29 has their own great review on the shoes, along with Wired and Agent Athletica. [caption id="attachment_10767" align="aligncenter" width="300"] Emily Andrews[/caption] Allbirds hasn't just made headlines for its super-soft shoes. This socially and environmentally conscious brand uses ZQ-certified wool, meaning it adheres to important sustainable farming and animal welfare guidelines. Their Soles4Souls partnership helps bring shoes to communities in need. Even the delivery process, which uses 40 percent less packaging than traditional shoeboxes, makes Allbirds wool runners a no-brainer for your feet and your heart. [caption id="attachment_10766" align="aligncenter" width="300"] Mother Mag[/caption] Unfortunately, the USA Allbirds online store does not currently offer international shipping. However, Big Apple Buddy, your personal shopper, can help you buy products direct from the official USA Allbirds online store and ship them to your doorstep, no matter where you are in the world. We offer international shipping to over 110 countries including Australia, Austria, Azerbaijan, Bahrain, Belgium, British Virgin Islands, Brunei, Bulgaria, Canada, Chile, Costa Rica, Croatia, Czech Republic, Denmark, Estonia, Fiji, Finland, France, French Polynesia, Germany, Gibraltar, Greece, Greenland, Hong Kong, Hungary, Iceland, Indonesia, Ireland, Israel, Italy, Japan, Jordan, Kuwait, Latvia, Liechtenstein, Lithuania, Luxembourg, Macau, Malaysia, Maldives, Malta, Marshall Islands, Mauritius, Monaco, the Netherlands, Netherland Antilles, New Zealand, Norway, Oman, Poland, Qatar, Romania, San Marino, Saudi Arabia, Serbia and Montenegro, Seychelles, Singapore, Slovak Republic, Slovenia, Spain, South Africa, St. Lucia, Sweden, Switzerland, Taiwan, Thailand, the UAE, the UK, Vatican City, and Vietnam. If you would like to buy from the USA Allbirds online store, simply get in touch and let us know which items you would like to order. We’ll get back to you with a free international shipping quote within 24 hours!